Q: We noticed that yesterday, the Foreign Ministry of China released information on Special Envoy of the ROK President Chung Eui-yong's visit to China. We know that he was here to brief the Chinese side on his visits to the DPRK and the US. With all these developments as well as President Trump's phone call to President Xi Jinping last Friday regarding the US opinions and considerations for the Korean Peninsula situation, what is China's evaluation on these developments of the Korean Peninsula situation? What is your expectation as to how the situation may evolve? How is China going to further leverage its role? A: On his visit yesterday, Special Envoy Chung Eui-yong briefed and had an in-depth exchange of views with the Chinese side on his visits to the DPRK and the US. President Xi Jinping met with him. State Councilor Yang Jiechi held talks with him. Foreign Minister Wang Yi also met with him. We have released information on these meetings respectively. 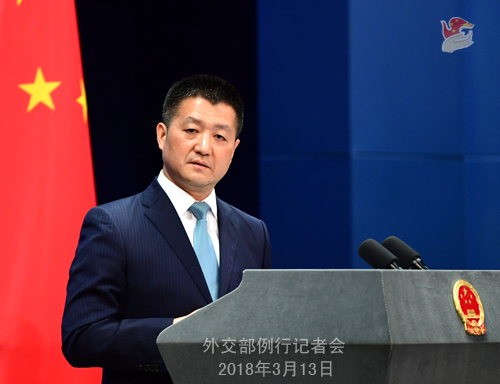 Last Friday, we also released information timely on President Xi Jinping's phone conversation with President Trump where the two heads of state compared notes on the latest Korean Peninsula situation. All these press releases give a full picture of China's relevant stance, policies and proposals which I will not repeat here. I can highlight a few points briefly on how China perceives the current Korean Peninsula situation. First, an opportunity has been presented to bring the Korean Peninsula nuclear issue back to the track of a negotiated settlement. This merits encouragement and support. We are glad that President Trump said he hopes the issue could be resolved finally through peaceful means, which is what China has been calling for all along. Special Envoy Chung Eui-yong also said that the ROK side appreciates China's commitment to a peaceful settlement of the Korean Peninsula nuclear issue, the denuclearization goal, and inter-Korean talks, which enabled positive progress on the Korean Peninsula issue. Second, the US and the DPRK eventually expressed their political will to have direct dialogues. This also merits encouragement and support. We look forward to see a smooth running of the inter-Korean meeting and DPRK-US talks. President Xi Jinping told President Trump very clearly that he hopes the US and the DPRK could begin contacts and dialogues sooner than later and strive to achieve positive outcomes. President Trump said that facts have proven that President Xi is right in insisting on the US having dialogues with the DPRK. Special Envoy Chung Eui-yong also thanked China for upholding direct talks between the US and the DPRK and looked to China to continue with its important role. 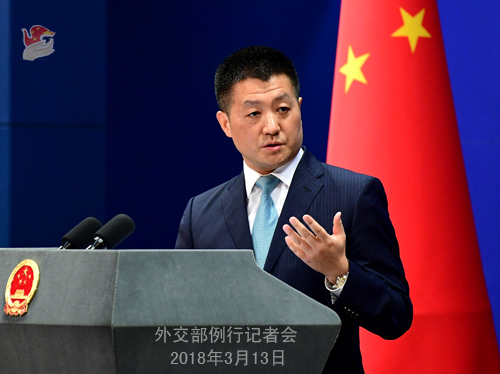 Third, China is firmly committed to realizing denuclearization, peace and stability of the Korean Peninsula, and resolving the issue through dialogue and negotiation. We will continue to play our unique role in getting the talks started and sustaining the talks till good outcomes are achieved and a peaceful, stable and denuclearized Korean Peninsula is realized. This serves the interests of not only the DPRK and the ROK, but also other regional countries, and meets the common expectations of the international community. Q: The United Nations Special Rapporteur for Human Rights in the DPRK says that any talks with the DPRK about its nuclear program should also be accompanied by talks in human rights, including accusations of "torture and the use of political prison camps". Does China agree or disagree with this point of view? A: I believe that you are very clear with our position on the Korean Peninsula issue as well as where we stand on the relevant UN agency's deliberations on the DPRK's human rights issue. Under the current circumstances, we hope that all relevant parties of the international community could make positive and constructive contributions so that the relevant parties of the Korean Peninsula issue could seize the opportunity and promote peace dialogues to achieve peace, stability and denuclearization of the Korean Peninsula, and bring about a final turn-around of the Korean Peninsula situation. As regards the related human rights issue, it shall be approached justly in light with the purposes and principles set out by the UN Charter. Q: First, has China discussed with the DPRK and the ROK the option of it hosting the relevant meeting on resolving the Korean Peninsula nuclear issue? Second, do you have a reaction to Canadian Prime Minister Justin Trudeau saying that China is dumping steel in Canada? A: As to the first question, like what I said just now, China is heartened by the positive momentum brought about by all relevant parties, especially the US and the DPRK, coming back to the negotiating table to resolve the Korean Peninsula nuclear issue, which we hope could be further encouraged and supported by all parties of the international community. We would like to see that relevant interactions and dialogues could go ahead and lead to positive outcomes sooner rather than later. Any form of engagement or any arrangement that helps to achieve that goal is worth encouraging and considering. China has been playing a positive and unique role and we have every intention to continue to do so. With regard to your second question, the Chinese government is resolutely determined to tackle the issue of excess steel capacity and has already taken practical measures to address that issue. We have made some notable progress, but not without great cost. Meanwhile, I have to remind you all that steel overcapacity is not a problem just for China only. It is a global one and as such, is impossible to be solved by any single country. We hope that all the steel-producing countries could make concerted efforts to cut steel overcapacity proportionately and resolve this issue through international cooperation. Q: Two people in the UK were poisoned after contacting unknown substance. One of them is the 66-year-old Sergei Skripal who used to work for the Russian military intelligence service. In response to this, British Prime Minister Theresa May said to the Parliament on March 12 that the British government believed that Russia was highly likely responsible for the poisoning incident. What is your comment? Do you believe this will become a new diplomatic scandal? A: We have noted relevant reports, but we are not aware of what really happened. Both the British and the Russian sides have responded to it. We hope that relevant parties could properly resolve this issue based on facts and through appropriate channels. Q: Nepali officials yesterday confirmed that a passenger plane carrying 71 people from Dhaka crashed while landing in Kathmandu, killing at least 49 people and injuring 22 others. According to reports, the spokesperson for the US-Bangla Airlines operating this plane said that one passenger on board was from China. Can you confirm this? A: We are deeply saddened by the heavy casualties caused by this accident. We express our deep condolences to the victims and sincere sympathy to the injured and the families who have lost their loved ones. According to the preliminary verification by the relevant Nepali authorities today, a Chinese citizen was killed in the crash. In the wake of the accident, the Chinese Embassy in Nepal immediately dispatched officials to the airport to verify relevant information and coordinated with the Nepali side to help the family of the deceased Chinese passenger with follow-up matters. The Foreign Ministry and the Chinese Embassy in Nepal will continue to follow the development of this incident and offer our best assistance to the bereaved family. Q: According to reports, on March 12, the United States has prepared a new draft resolution asking the UN Security Council to demand 30-day ceasefire in Syria's eastern Ghouta and Damascus. What is China's opinion about this proposal and if the US put this draft to a vote, what position will China hold? A: Last month, the UN Security Council unanimously adopted Resolution 2401 on the humanitarian issue of Syria, which reflects the shared will of its members on realizing ceasefire and cessation of violence in Syria and improving its humanitarian situation as soon as possible. Currently, the situation in eastern Ghouta is still very complicated. All relevant parties should join hands to coordinate their efforts on many fronts, including combatting terrorism, promoting ceasefire and cessation of violence, stepping up humanitarian aid, and strive to meet the requirements and goals set out in Resolution 2401. Meanwhile, China still hopes that the Security Council could remain united on the humanitarian issue of Syria, as this will ensure its constructive role. Q: According to reports, European officials say that China might delay or scale back the 16+1 summit that is supposed to be held in Bulgaria this year between China and Central and Eastern European countries. Can you give us any details from the Chinese side as to your thinking about the 16+1 summit this year? A: I have noted the relevant report, but I haven't heard of anything as mentioned by you. Thanks to the concerted efforts of all relevant parties, the cooperation between China and Central and Eastern European countries(CEEC) has sustained a sound momentum of growth and yielded fruitful outcomes in the past five-plus years. This has not only elevated the relations between China and the Central and Eastern European countries, but also played a positive role in advancing the European integration and balanced development of Europe. The rapid development of China-CEEC cooperation cannot be achieved without the guidance of the leaders' summit. At the end of November last year, the 6th 16+1 Summit reached the consensus on Bulgaria hosting the 7th leaders' Summit. China attaches great importance to this and remains in close communication with relevant countries on the preparations of the summit. Q: Can you give any insights on why the air pollution in Northern China seems to have got worse after sharp improvement at the end of last year? Is China still committed to cutting its emissions and the Paris Climate Change Accord? A: I will get to your second question first, since it sounds more like a diplomatic one. China has played a positive and important role in hammering out the Paris Accord. The international community knows that very well. The commitments, once made, will be strictly honored by the Chinese government. According to the statistics of the environment departments in China, last year's air quality nationwide, including northern China, has experienced a major improvement. You all work and live here. You must have all experienced that improvement. As for why so smoggy these two days, that calls for specialized analysis by competent departments. We hope that you could acknowledge what we have done painstakingly to improve the environment. We do have reason to feel confident about that. 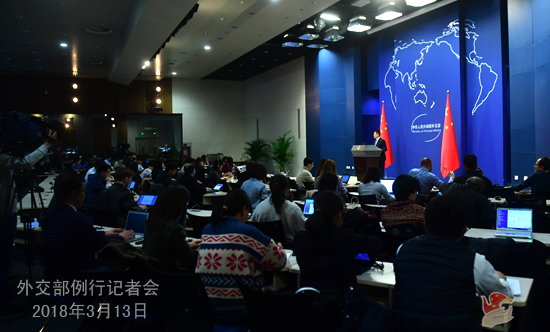 Q: This morning, China announced restructuring plans for the State Council which include setting up a national body to supervise international development aid, taking some power that were previously under the Commerce Ministry and the Foreign Ministry. Can you comment on what relationship will be between the Foreign Ministry and this new international aid body and whether this represents a reduction in the Foreign Ministry's powers? A: Thank you for following China's Two Sessions this year. This morning, State Councilor Wang Yong presented the plan for the State Council institutional reform to the first session of the 13th National People's Congress. He detailed the specific considerations behind making these changes, including on setting up a national agency on international development and cooperation. You may refer to that. As explained, to set up such a body is to fully leverage the role of foreign aid as an important means of major-country diplomacy, strengthen the strategic planning and coordination for foreign aid-related work, manage such work in a more unified manner, and reform and optimize models of foreign aid, so as to better serve the country's diplomatic blueprint and the Belt and Road Initiative. The plan proposes to integrate foreign aid-related mandates from the Commerce Ministry and the Foreign Ministry and form a national agency on international development and cooperation and outlines the main duties of this new body.